Our team of experts have over 70 years of combined fence installation experience for King and Pierce County. Our quality craftsmanship shows in every fence installation because we take great pride in the work we do. We walk our clients through every phase of fence installation and planning, taking time to answer all questions. We ensure the work is done right the first time so our King and Pierce County clients come to us for their next fence project. No matter what size the project, we will accomplish it in a timely manner. We are not only experts in fence installation and repair for all types of fencing, but we also provide professional high quality fence materials to the King and Pierce County public. We offer a full service welding shop that specializes in the fabrication of fencing, gates, gate repair, and other custom applications so that your fence can offer safety, privacy, and security. We have many fence styles and below are the most common fences we build. We can incorporate different options into our fence styles to give our King and Pierce County clients the perfect look. If you do not find what you are looking for here we would be happy to hear your ideas. We can match most fences so if you see one you like in your King and Pierce County neighborhood, we will drive by and take a look. Schematics are available upon request. The Standard Estate Fence is a basic style of fence that offers the client the best bang for their buck. The framing can be seen on the interior side of the fence while the exterior side appears smooth between the posts. The Full Panel Fence is also known as the “Good Neighbor Fence” because both sides are visually the same. 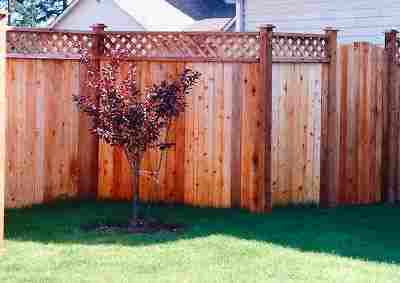 It offers a trim piece along the top to give the fence a finished look. The bottom frame piece and trim is located above the ground. The Picture Frame Fence offers both top and bottom trim. The bottom frame and trim piece run along the ground to create the “picture frame” appearance. Similar to the Full Panel Fence, the Picture Frame Fence provides visual appeal to both sides. The Lattice Top Fence has lattice running along the top portion of the fence. The lattice can be diagonal or horizontal depending on the client’s taste. The lattice is designed to give the fence a decorative finish. The Kirkland Fence was designed to give our King and Pierce County client’s an alternative to the lattice. It provides extra structural support while incorporating a simple design element. There are many varieties of chain link fencing for King and Pierce County. The basic chain link system is made of galvanized (grey) materials and can have a tension wire along the top and bottom edges. Options are available to add rail along the top or bottom to give the fence more support and to protect the bottom chain link fabric against animals and garden equipment. Chain link is also available in color applications to blend in with most landscapes.